(Francisco Kjolseth | The Salt Lake Tribune) Dar Willes is embraced by her mother Nacele Hart during a special show of more than 100 quilts and numerous sewing projects created by Nacele over a 10-year period for her children, grandchildren and great-grandchildren. On Friday at a church in Orem her family put them on display with plans to hand them out Saturday to her loved ones. She's also currently battling cancer. (Francisco Kjolseth | The Salt Lake Tribune) Nacele Hart overlooks her more than 100 quilts and numerous sewing projects created over a 10-year period for her children, grandchildren and great-grandchildren. On Friday at a church in Orem her family put them on display with plans to hand them out Saturday to her loved ones. She's also currently battling cancer. (Francisco Kjolseth | The Salt Lake Tribune) Nacele Hart overlooks her more than 100 quilts and numerous sewing projects created over a 10-year period for her children, grandchildren and great-grandchildren. On Friday at a church in Orem her family put them on display with plans to hand them out Saturday to her loved ones. She's also currently battling cancer. (Francisco Kjolseth | The Salt Lake Tribune) Sherry Crandall, left, points out her favorite Gunne Sax dress made by her mother Nacele Hart for her and her three sisters during an exhibit of Nacele's work in Orem. (Francisco Kjolseth | The Salt Lake Tribune) Nacele Hart has made more than 100 quilts and numerous sewing projects over a 10-year period for her children, grandchildren and great-grandchildren. On Friday at a church in Orem her family put them on display with plans to hand them out Saturday to her loved ones. She's also currently battling cancer. (Francisco Kjolseth | The Salt Lake Tribune) Nacele Hart has made more than 100 quilts and numerous sewing projects over a 10-year period for her children, grandchildren and great-grandchildren. On Friday at a church in Orem her family put them on display with plans to hand them out Saturday to her loved ones. She's also currently battling cancer. (Francisco Kjolseth | The Salt Lake Tribune) Becky Thorpe, left, of Heber visits her former neighbor Nacele Hart who has made more than 100 quilts and numerous sewing projects over a 10-year period for her children, grandchildren and great-grandchildren. You can feel the love and emotion and see the impact she's made, said Thorpe upon entering the gym at the ward house in Orem where the quilts were on display. (Francisco Kjolseth | The Salt Lake Tribune) Nacele Hart has made more than 100 quilts and numerous sewing projects over a 10-year period for her children, grandchildren and great-grandchildren. On Friday at a church in Orem her family put them on display with plans to hand them out Saturday to her loved ones. She's also currently battling cancer. (Francisco Kjolseth | The Salt Lake Tribune) A photo of Marie Anderson, great grandmother of Nacele Hart was on display during a show of the extensive quilt work created by Hart over the past 10-years. On Friday at a church in Orem her family put the quilts on display with plans to hand them out Saturday to her loved ones. She's also currently battling cancer. (Francisco Kjolseth | The Salt Lake Tribune) Nacele Hart overlooks her more than 100 quilts and numerous sewing projects created over a 10-year period for her children, grandchildren and great-grandchildren. On Friday at a church in Orem her family put them on display with plans to hand them out Saturday to her loved ones. She's also currently battling cancer. (Francisco Kjolseth | The Salt Lake Tribune) Nacele Hart has made more than 100 quilts and numerous sewing projects over a 10-year period for her children, grandchildren and great-grandchildren. 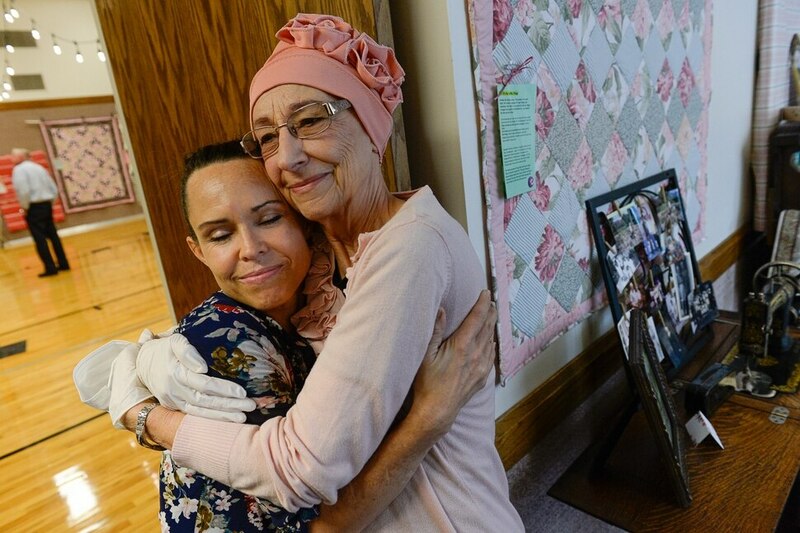 On Friday at a church in Orem her family put them on display, including a few quilts made by previous generations with plans to hand them out Saturday to her loved ones. She's also currently battling cancer. (Francisco Kjolseth | The Salt Lake Tribune) Nacele Hart overlooks her more than 100 quilts and numerous sewing projects created over a 10-year period for her children, grandchildren and great-grandchildren. On Friday at a church in Orem her family put them on display with plans to hand them out Saturday to her loved ones. She's also currently battling cancer. (Francisco Kjolseth | The Salt Lake Tribune) Nacele Hart, second from left, is show with her sisters along with other memorabilia as her daughters assembled a show of her more than 100 quilts and numerous sewing projects over a 10-year period for her children, grandchildren and great-grandchildren. (Francisco Kjolseth | The Salt Lake Tribune) Nacele Hart, 77, remembers sewing on her grandmother's machine when the power went out. 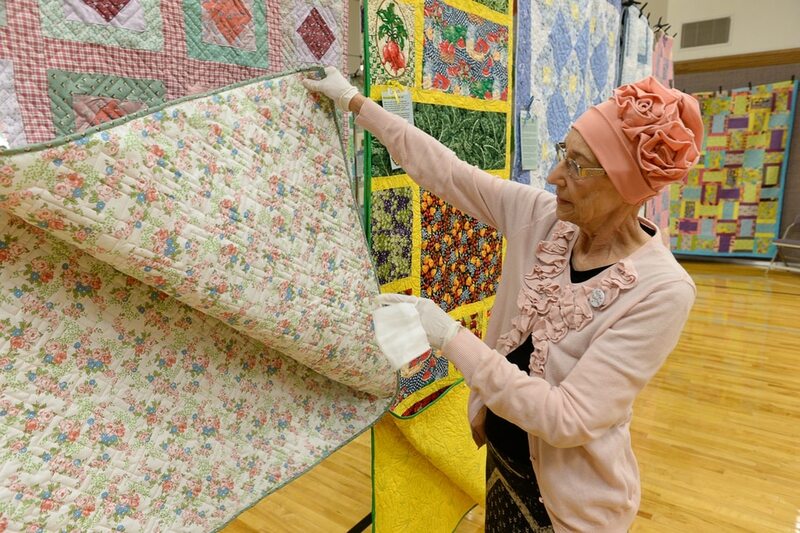 The antique was on display along with over 100 quilts and numerous sewing projects created by Hart over a 10-year period for her children, grandchildren and great-grandchildren. (Francisco Kjolseth | The Salt Lake Tribune) Nacele Hart has made more than 100 quilts and numerous sewing projects over a 10-year period for her children, grandchildren and great-grandchildren. On Friday at a church in Orem her family put them on display with plans to hand them out Saturday to her loved ones. She's also currently battling cancer. (Francisco Kjolseth | The Salt Lake Tribune) Overlooking her handy work, Nacele Hart has made more than 100 quilts and numerous sewing projects over a 10-year period for her children, grandchildren and great-grandchildren. On Friday at a church in Orem her family put them on display with plans to hand them out Saturday to her loved ones. She's also currently battling cancer. 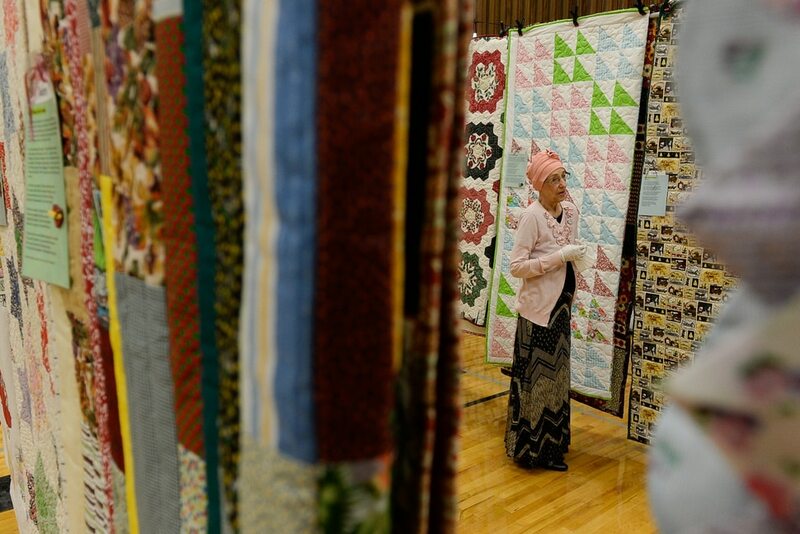 Orem • Rows of quilts filled the wardhouse gymnasium, making a rainbow of patterns and colors. More spilled out into the hallway, hung on the walls alongside multiple lifetimes’ worth of clothes and heirlooms. Over her lifetime, 77-year-old Nacele Hart has made hundreds of quilts for newborns, birthdays, anniversaries and special events, pouring love and creativity into each one. Friday was the self-taught quilter’s first show — a culmination of a goal she made a decade ago to stitch 100 more quilts. She decided she’d imbue each with a message — a “life lesson or a principle of the Gospel or a song or something that was meaningful in my life” — and give them to family members. It was a lofty goal at the time, having just returned from a mission for The Church of Jesus Christ of Latter-day Saints in Australia. And then, 3½ years ago, she was diagnosed with uterine cancer. She kept quilting, crafting blankets for new great-grandchildren and adding to the colorful stacks in her home. Her children urged her to think about publicly displaying the quilts she’d made so far — there didn’t have to be 100. After treatment and surgery to remove “anything they thought carried the cancer,” it seemed she had it beat. But the cancer returned early this summer — this time, metastasized, aggressive and inoperable. Hart lurched back to the beginning of the process, seeking treatment options, overcoming denial — and finishing the final two quilts in time to give them away. On Friday, more than 100 of Hart’s quilts went on display for for friends, family and the community before being collected by their new owners. Among the soft masterpieces on display: a farming-themed blanket, with John Deere tractors and strips of alternating crops. Several had patriotic motifs with stars, stripes and splashes of red, white and blue. Another had pockets sewn into it for doll clothing. Hart, born in Garland, Utah, says some of her earliest memories are of drawing patterns and pictures of skirts and dresses she wanted her mother to sew for her. “I kind of learned from her that you can make your own patterns and do your own thing,” she says. She never took home economics. “I didn’t think I’d like it,” she says. In the decades she spent raising children — her oldest is now 57, the youngest 32 — she made blankets, sewed clothes and even stitched doll quilts for her family. And she kept quilting as the family grew: Hart has 16 children, 59 grandchildren and 63 great-grandchildren. Kamilla Sewell, one of Hart’s granddaughters, came down from Rexburg, Idaho, for the quilt show. Hart has given her several quilts throughout her life. The stories and emotion tied to each quilt means more than the physical fabric, she says. On Thursday, Hart finished her 12th round of chemotherapy, out of a planned 18. Her treatment also includes a five-week radiation regimen, and surgery is a possibility. “It’s kind of a long haul,” she says. As her energy sapped further and further after each round of chemo, she found she couldn’t plan the quilt show herself. But her kids wouldn’t let her cancel. Neighbors also pitched in, helping Hart with the logistics of planning and printing out descriptions for each quilt. Finishing the last two quilts after Hart’s cancer returned required extra emotional and physical determination — but the singular goal helped distract her from the toll of treatment. She named one of the final quilts “It’ll Be OK,” a tapestry of complicated stitching and blocks of color. The final, 110th quilt is tiny, big enough to be used only by a child or to hang on the wall. It’s themed after Mesa Verde National Park, with swathes of squares bearing the park’s name surrounded by a line of pottery fabric. In August, she put photos of the quilts online for her children — then, in descending age order, grandchildren, then great-grandchildren older than 8 — to choose from. After each was claimed — a fairly smooth process, Hart says, with favorites rarely overlapping — she tagged each quilt with the intended recipient’s name and a special message. Hart will hang on to one quilt, at her husband’s request. “It’ll Be OK” will stay with her. Hart sees overlapping themes in her quilting mentality and her approach to cancer treatment. It’s a methodical march — counting down each round of chemotherapy until the projected end of the cycle, around Christmas. Her focus on this final big project was guided by the desire to leave behind messages of hope, spirituality and family that would resonate in perpetuity, even if the seams eventually unravel. Dar Willes, another of Hart’s daughters, says it’s “so rewarding” to see family members, neighbors and friends gather to celebrate her mother. “She’s just so happy, and it means everything to us that she can see how much she’s loved,” Willes says. As her loved ones walk away with their quilts, Hart says one message rises above the rest.